is not based on Hindutva, Indian political nationalism rooted in a conservative, parochial conception of Hinduism. 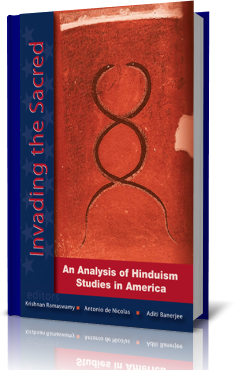 Although the book focuses on the excesses of AAR and RISA scholars, the arrival of Hinduism’s new, non-Hindutva, insider defenders represents an important, new direction in how Hindus have begun to understand themselves and their religion as well as how they explain Hinduism to non-Hindus. It should be noted that this is but a tiny sample of the racy, highly eroticized interpretations of Hinduism that can be found in modern, Western indological studies. Willfully mistranslated passages, shoddy scholarship, and anti-Hindu bias are similarly documented. A number of the scholars whose work has been criticized in this book in turn have tried to defend their questionable practices or have tried to vilify those who have objected. Sometimes, as also documented in this book, the American mainstream media has been complicit in protecting the reputations of these scholars. Bhattacharyya found many deficiencies in Kripal’s work. Kripal was found to have an inadequate grasp of Bengali, and he had virtually no background or training in Freudian psychoanalytic theory and practice. Not only did Bhattacharyya find Kripal guilty of outright misuse of Freud’s methodologies, such that it would “force Freud to sit up in his grave and take notice,”6 he often found Kripal’s interpretations to be willful distortions. Like Bhattacharya’s analysis, many of the essays in Invading the Sacred highlight the use and misuse of Freudian psychoanalysis, and they point out that Freud’s approach is also widely discredited.